Format: Hardcover, 1st ed., 214pp. 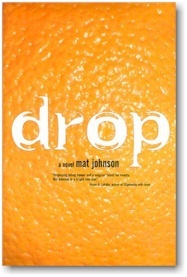 "Drop is a hip, contemporary morality tale set on two continents. The novel is at times predictable, but the language is so alive, crispy-fresh and musical that you will find yourself reading aloud. �Bring-Bring me somewhere lovely where people are so alive you can hear their pulses bump-bumping as they pass you on the street,� whines Chris Jones. He is a victim of the Philly ghetto who would sell his soul to escape his fate. He does manage an escape by �pimping perfection� to the public as a top young creative wizard, putting a London advertising agency on the map.